While Navy Capt. J.J. Cummings ’89 has commanded the USS Gerald R. Ford for only a few days, he shows no signs of letting the captainness overshadow his J.J.-ness. Last Friday, during the change of command ceremony at Virginia’s Naval Station Norfolk, Cummings broke up the audience with a joke that cleverly spoke to who he is and where he comes from. So there it is: The U.S. has 11 nuclear-powered aircraft carriers, and a Bates grad commands one of them. And it’s not just “one of them”: the Ford is the Navy’s newest, the world’s largest, and the first of its class. 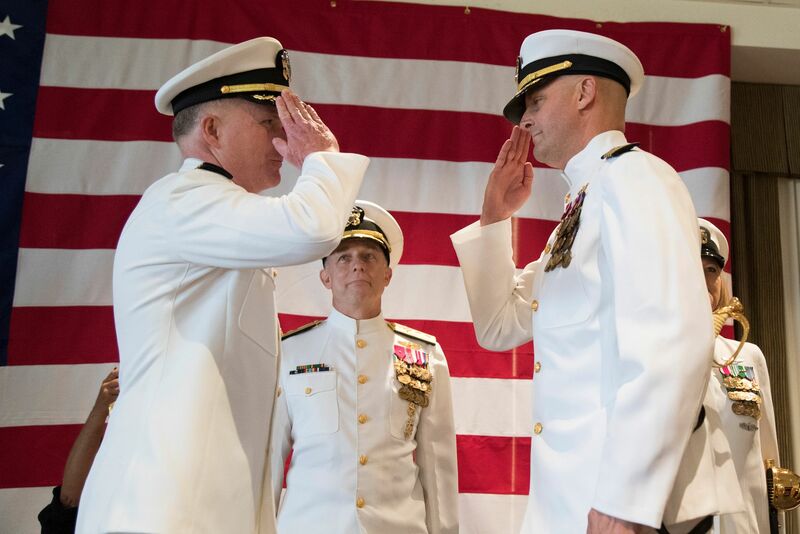 The Navy selects and grooms future carrier captains from the ranks of its carrier aviators, and in that way, Cummings’ path to the Ford is typical. A fighter pilot, he earned his wings in 1993 and has totaled 3,850 flight hours and 704 carrier landings. What’s distinctive about Cummings’ career is how and where it started. 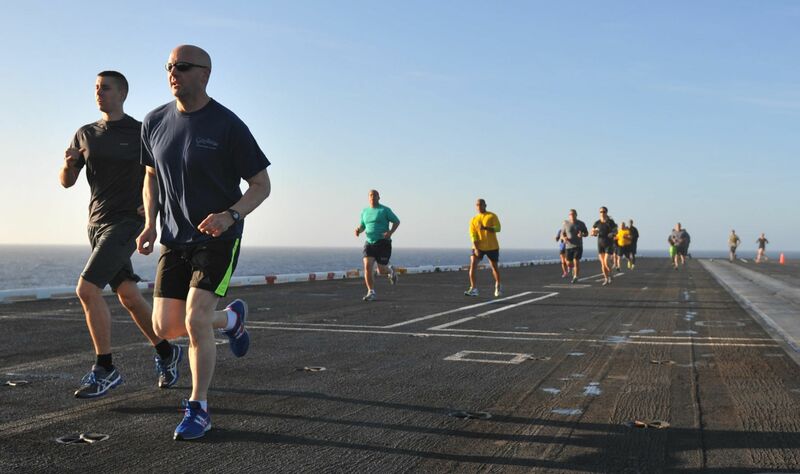 The Navy has 11 nuclear-powered aircraft carriers, and their captains are often graduates of the U.S. Naval Academy or attended a university and earned their commission as officers through Navy ROTC. Which means that the schools of the NESCAC aren’t exactly feeders for carrier command. Yet Cummings got his start in the Navy as an enlisted sailor when he was a Bates student, back in the 1980s. He visited a recruiter and expressed interest in being a naval aviator. The recruiter offered sound advice: Cummings should first join the Navy Reserve, which might improve his chances of someday being selected for aviation officer training. “He said it would make my package that much more impressive,” Cummings recalls. He enlisted in 1986, after his first year, and did basic training in Great Lakes, Ill., during the winter semester of his sophomore year, then became a hospital corpsman attached to a Marine Reserve company in Topsham. The strategy worked. In 1990, about to ship out to the Gulf War with his company, he learned that he’d been accepted to Aviation Officers Candidate School. Among 300 eligible candidates in the New England area, only Cummings was chosen. Being the captain of an aircraft carrier is one of those jobs that really is as huge as it sounds: It’s considered “the pinnacle of ‘major command’ for the Navy,” explains John Garofano ’82, professor of strategy and policy and former academic dean at the Naval War College in Newport, R.I.
And the Ford is literally in a class of its own, the first carrier of a brand-new design. “It has a number of brand new high-tech systems, from propulsion to aircraft launch and recovery,” Garofano says. 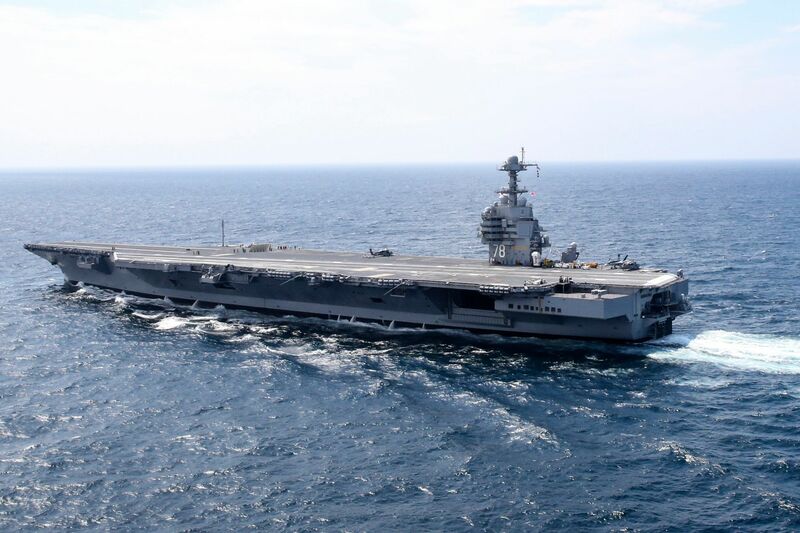 The carrier is the largest in the world. At 1,092 feet long, it’s longer than all of Alumni Walk, from College Street to Commons. When deployed with its nine aircraft squadrons, the ship will have a crew of 4,550. The most important relationship that J.J. made at Bates was with Sara Hagan ’89; they were married in 1994 and have three children. “I knew a thousand years ago that I wanted to marry her,” he says. “I would not be in the Navy except for her; she can manage the insanity” of Navy family life, with long deployments and frequent moves. Following sea trials in 2017 and early 2018, the Ford is now at Huntington Ingalls Newport News shipyard for a year-long scheduled maintenance period known as “post-shakedown availability.” Which means that Cummings’ likely two-and-a-half year command will focus on getting the ship ready for its deployment, including repairs at the shipyard and then more sea trials. He won’t be the captain when the Ford has its first deployment at sea far, far away. Garofano suggests that the Navy may have chosen Cummings for the Ford with his personality and leadership style in mind. “He’s the third commanding officer. The first was the CO during construction, the second during shakedowns, and he will be taking it to or close to full operational status. He certainly has the experience for it. Like other aviators of his generation, Cummings gained his combat experience after 9/11. That fateful morning, he was at home in Virginia with his family, getting ready for a scheduled deployment from Naval Air Station Oceana, when he saw Flight 175 hit the South Tower on TV. Leadership opportunities followed, and Cummings seized them, as executive and commanding officer of a fighter squadron aboard the USS Harry S. Truman. 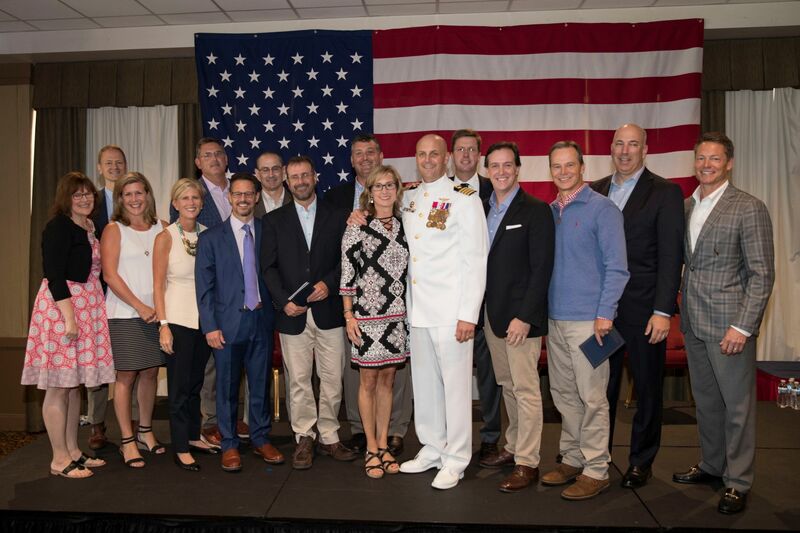 Shore assignments later in the 2000s, including stints with a strategic and logistics focus at NATO and at the U.S. Joint Forces Command, both based in Norfolk, created more forward motion for his career. Along the way, he earned master’s degrees at Old Dominion and the Naval War College, in education and national security and strategic studies, respectively. By then it was clear that Cummings was a “hot runner” — Navy parlance for someone advancing quickly along an incredibly competitive pipeline — and he was selected in 2010 for Navy Nuclear Power School, aka nuke school. There, he received advanced training to serve on a U.S. nuclear-powered aircraft carrier, of which there are 11. Topics at nuke school, in Goose Creek, S.C., cover everything from nuclear physics to reactor dynamics; it’s considered the most difficult academic curriculum in the U.S. military, and sailors typically spend about 45 hours a week in class. There’s an old saying that your GPA never matters after your first job. But to be eligible for nuke school, Cummings, who majored in physics at Bates, had to dust off — and confront — his 1980s Bates transcript. He got selected (and he credits physics faculty members like Gene Clough and Mark Semon, both now retired, for their support). 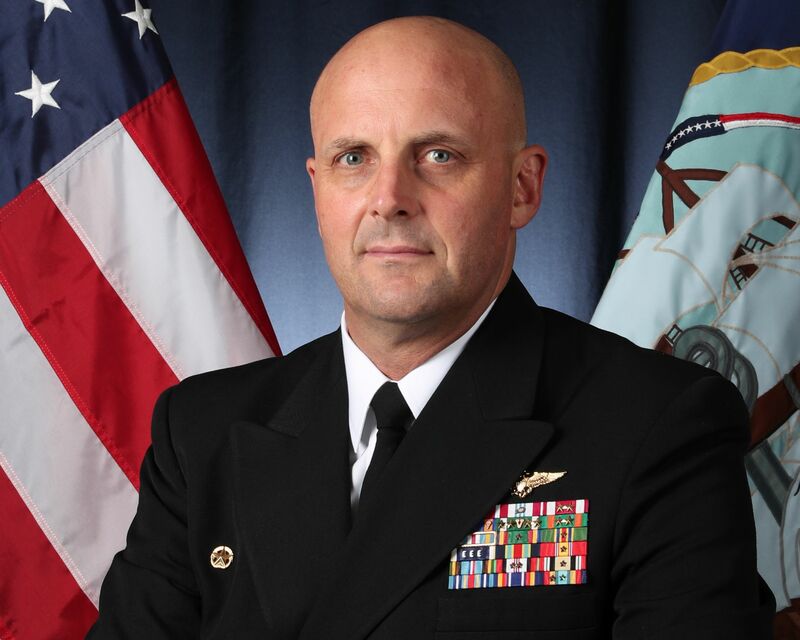 Cummings completed nuclear power training in 2012, then served as the executive officer of the carrier USS Nimitz, 2013–15, before commanding the USS Anchorage, an amphibious assault warship that transports Marines into a war zone. Thirty-two years have passed since Cummings enlisted in the Navy. While his J.J.-ness is intact, as is his love for his job, what drives him as the captain of the Ford feels different, he says, from what propelled him to enlist at Bates.